wgms3d is a freely available software tool that calculates the modes of dielectric electromagnetic waveguides. leakage losses due to waveguide curvature and / or frustrated total internal reflection (ARROW waveguides, substrate leakage). This software can currently not handle photonic-crystal waveguides, metallic insets, or curved metallic boundaries. The waveguide is assumed to have a piecewise constant refractive-index profile (a "step-index" profile), i.e., the waveguide cross section can consist of several adjacent regions of constant refractive index. 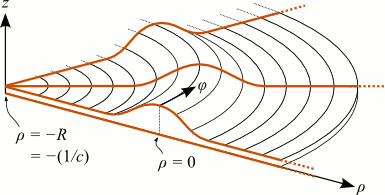 The interfaces between these regions do not need to coincide with the discretization grid: dielectric interfaces may be straight (under any arbitrary angle) or curved (as in optical fibers). The dielectrics are assumed to be isotropic and non-magnetic. Lossy materials are supported in the form of materials with complex refractive indices. The entire waveguide may be curved along the propagation direction, thus enabling the computation of bending or curvature losses. The simulation is based on cylindrical coordinates adapted to the waveguide curvature and does not rely on the widespread approximate equivalent-straight-waveguide model. By default, the computation is fully vectorial. It does not make any a-priori assumptions about the magnitude of the six electromagnetic field components. Approximate scalar or semi-vectorial calculation modes may optionally be enabled by the user. The four edges of the rectangular computational domain are enclosed by perfectly electrically or magnetically conducting walls. These walls may be padded with Perfectly Matched Layers in order to absorb outgoing radiation and thus simulate leakage and curvature losses. The software is written in C++ and uses the ARPACK and SuperLU libraries to solve the discretized eigenproblem. It should compile under any Unix-like operating system. Scripts for post-processing and visualization of the results in GNU Octave and Matlab are provided. wgms3d is free software under the GNU GPL. Introduced a new parallel / distributed eigensolver backend based on MPI / PETSc / SLEPc for large-scale simulations. This work was inspired by initial experiments done by Henry Wu with pwgms3d. Can choose during configuration stage whether to use the new MPI-based parallel eigensolver backend or the old one based on SuperLU / ARPACK. Fixed some of the Matlab scripts for compatibility with GNU Octave. 01-Dec-2013: Thanks to Henry Wu, there is a parallelized version of wgms3d-1.2 now. It is based on the SLEPc eigensolver library and can be significantly faster than the ARPACK-/SuperLU-based code. Until his changes have been merged into the main wgms3d branch, you can download his version of wgms3d here. Use it at your own risk; no in-depth comparison of the results of old and new wgms3d have been performed yet. Updated installation instructions and build script for the ARPACK-NG library distribution. It is no longer recommended to use my old self-packaged and slightly modified version of ARPACK. This simplifies installation and makes wgms3d work on platforms where it didn't work before (thanks to Thach Nguyen for the reports). In the semi-vectorial calculation mode, derived fields (transverse E field + longitudinal E and H fields) can now be exported. Also, added a new test script 'tests/semivectorial/', which compares the full-vectorial (exact) and semi-vectorial (approximate) modes in a waveguide at different wavelengths. As expected, the error of the SV approximation becomes smaller towards shorter wavelengths. Added a new test script 'tests/complex_modes/'. It checks whether complex modes are calculated correctly by reproducing the effective-index data from Fig. 4b of Strube's 1985 MTT article. Extended the script 'matlab/wgms3d_mgp_rib_waveguide.m'. It can now generate strip waveguides or "photonic wires", too. Just set the etch depth D to the same value as the central rib height H. See documentation inside that script. Fixed the script 'matlab/wgms3d_plot_refractive_index.m'. It now correctly loads 'epsis.bin' instead of 'epsis.txt'. Fixed handling of comment lines in MGP files (those starting with a '#' sign). More detailed information on what has changed between releases may be found in the text files NEWS and ChangeLog inside the distribution. If you want to be notified about future updates, consider subscribing to the project on freecode. Please cite the latter paper in your own articles if you found this software useful for your research. The development of this software was supported by Freie und Hansestadt Hamburg under grant "Hybride Mikrophotonik" and by the Deutsche Forschungsgemeinschaft (DFG) within Forschergruppe FOR 653.